Geothermal energy comes from the heat beneath the Earth's surface, from large and complex power stations to small and relatively simple pumping systems. At the center of the Earth, temperatures can be as hot as the surface of the sun, however, within the top 15 meters of the Earth's surface is a much cooler, relatively stable temperature, which increases 3°C for every 100 meters below ground. This constant temperature can be tapped into and used to heat or cool buildings. In most places around the world, the temperature at 10 feet below ground level remains between 50-60 degrees Fahrenheit all year long. During the winter, a geothermal heat pump pulls heat from the relatively warmer ground and pumps it into a building. In the summer, the pump cools the same building by pulling the building's warmer air into the relatively cooler ground, where the excess energy can be used in turn to heat water. Geothermal energy can be used for a diversity of functions in addition to fueling power plants, homes or businesses for electricity, such as to heat spas, swimming pools, greenhouses, aquaculture facilities and for food dehydration (e.g. the drying of fruit and vegetable products), laundries, gold mining, milk pasteurizing and more. Geothermal energy is a vast underutilized heat and power resource that is renewable, baseload, domestic and clean. 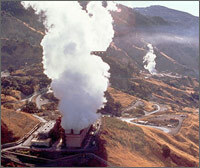 Although Geothermal plants produce 25% or more of electricity in the Philippines, Iceland, and El Salvador, the United States, as of 2010, produced just over 3,000 megawatts of geothermal energy, or less than half a percent of the electricity used in the country, but has more geothermal capacity than any other country with most of this power residing in California. The U.S. Geological Survey estimates 500,000 MWe of EGS geothermal resource potential lies beneath the western United States. This is approximately half of the current installed electric power generating capacity in the United States. A power plant built today would probably require about $0.05 per kWh, which is cost-competitive with fossil fuel energy, although some plants can charge more during peak demand periods. Like most renewable energy, the initial costs of drilling and installing geothermal power plants can be high, but there are no fuel costs and the operation and maintenance costs are low. This makes for a good long-term, sustainable investment, such as a geothermal plant in Italy, which has been in operation since 1913, demonstrating the sustainability of this power source, and keeps the price of energy from fluctuating the way oil can when unrest in the Middle East escalates and relatively easily-obtainable oil reserves deplete. Learn more. The U.S. Geological Survey estimates 500,000 MWe of EGS geothermal resource potential lies beneath the western United States. This is approximately half of the current installed electric power generating capacity in the United States. Learn more. The U.S. Department of Energy estimates there are prodigious amounts of heat at depths from 3 to 10 km and concluded that geothermal energy could provide 100,000 MWe or more in 50 years by using advanced EGS technologies. Learn more. Geothermal resources are considered base load meaning they are available 24 hours a day, 365 days a year, regardless of weather conditions. Fossil-fueled power plants produce electricity 65-75% of the time compared to 90% from geothermal power plants. Learn more. 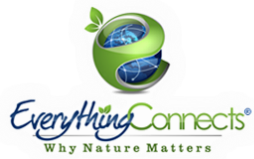 Geothermal power is a clean, renewable way to produce energy that doesn't require the burning of fossil fuels and all of the subsequent ills that come along. Geothermal power plants emit only excess steam and very few trace gases, which contain 1,000-2,000 times less CO2 than fossil fuel power plants. Enhanced Geothermal Systems (EGS) have an enormous potential to be an important contributor to the U.S. energy portfolio as a source of clean and sustainable energy. Learn more. Geothermal power is domestic power. Geothermal resources can be harnessed for power production without importing fuel, which also promotes national security. Enhanced Geothermal Systems (EGS) will increase energy production by producing geothermal energy in new environments and at various depths under the Earth's crust. Learn more. Geothermal power plants have a very small footprint and are compact, using less land per GWh (404 mi2) than coal (3642 mi2) wind (1335 mi2) or solar PV with center station (3237 mi2). In addition to taking up very little land compared to traditional fossil fuel plants, the advanced drilling techniques minimize the impact of drilling wells. Modern closed-loop geothermal power plants emit no greenhouse gasses other than vapor from water that may be used for cooling. The life cycle greenhouse gas emissions of geothermal plants are six to twenty times lower than natural gas. Geothermal power plants consume less water on average over the lifetime energy output than the most conventional generation technologies. Learn more. Enhanced Geothermal Systems (EGS) has the potential to create high-paying, long-term jobs. In 2008, the geothermal industry accounted for 25,000 jobs. Geothermal power plants emit very little air pollution and sometimes, none at all. According to the U.S. Department of Energy, "Geothermal fields produce only about one-sixth of the carbon dioxide that a relatively clean natural-gas-fueled power plant produces, and very little if any, of the nitrous oxide or sulfur-bearing gases. Binary plants, which are closed cycle operations, release essentially no emissions." Geothermal heat pumps can be used almost anywhere. In most places around the world, the temperature at 10 feet below ground level remains between 50-60 degrees Fahrenheit all year long. This constant temperature can be tapped into and used to heat or cool buildings and for a host of other purposes. When a heat pump is used to provide domestic heating, the savings on electricity alone can outweigh the cost of installing and running the system. Learn more. Geothermal energy is a great benefit to agriculture, human health and the economy. According to the U.S. Department of Energy, "Most greenhouse operators estimate that using geothermal resources instead of traditional energy sources saves about 80% of fuel costs — about 5% to 8% of total operating costs. The relatively rural location of most geothermal resources also offers advantages, including clean air, few disease problems, clean water, a stable workforce, and, often, low taxes."